Any applicant who is looking to apply for either Indefinite Leave to Remain (ILR) or British Citizenship will need to satisfy two requirements. One is Knowledge of Language 'KOL' (English) at level B1 according to the Common European Framework Reference (CEFR). Competence will be tested at Speaking and Listening only. The test needs to be sat at a Home Office approved Secure English language Test (SELT) centre. 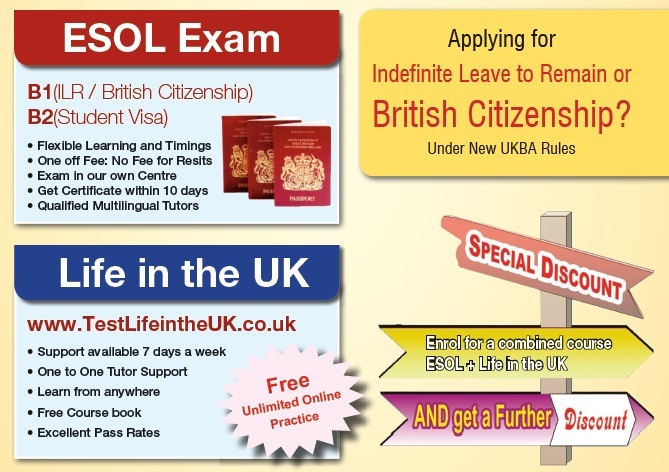 In addition to the English language requirements applicants will also need to pass the 'Life in The UK' test at a Home Office approved test centre. Any applicant who is applying to extend their visa as a spouse of a British Citizen or married to a person who has Indefinite Leave to Remain in the UK will need to satisfy Knowledge of Language (KOL) at level A2 according to the Common European Framework Reference (CEFR). Competence will be tested at Speaking and Listening only. Again to satisfy the requirements this test needs to be sat at a Home Office approved Secure English Language Test (SELT) centre. Any applicant who is applying as a spouse of a British National or married to a person with Indefinite leave to Remain in the UK will need to satisfy Knowledge of Language (KOL) at level A1 according to the Common European Framework Reference. Competence will be tested at Speaking and Listening only. All applicants will need to sit the test in their own country. If the applicant is based in the UK they will need to sit the test at a Home Office approved Secure English Language Test (SELT) centre. Extra Learning has been an experienced leading provider of quality education to meet the needs of the local and wider community over the past eight years. We focus on the individual needs and requirements of our learners. Our teachers are experienced at every level enabling them to provide the best quality of teaching. Furthermore we are an officially approved Trinity SELT course preparation centre. This enables our tutors to get all the official training and teaching resources directly from Trinity SELT awarding body. Extra Learning offers flexible learning this is why we are open 7 days a week.